Â· Now, the international superweb being what it is, you are never alone, no matter how deviant you are. And so I am proud to be able to present you with our big find of the weekend, the Insultingly Stupid Movie Physics Pages (www. intuitor.com/moviephysics/). It’s their indignation that makes it such good fun. For example, from their review of Star Wars: “In the great battle scene, the bad guys drive up in giant tanks and attempt to blast the good guys who are protected by their force field. This force field is transparent to visible light but nevertheless repels blasts of visible laser beams.” And they reserve particular derision for spaceships exploding in space (where there is no air, and no one can hear you scream) and the fact that you cannot only see it, but also hear it, with the sound waves miraculously arriving not just through a vacuum but at the same time as the light. Â· But it gets worse. Proper little Rottweilers, these physicists, and they follow through on the maths. People flying backwards when hit by bullets? Not when the velocity of the victim will be equal to the velocity of the bullet multiplied by the ratio of the mass of the bullet to the mass of the victim – 0.4 miles an hour, they reckon. Copper-plated bullets flashing off steel? They snort with laughter. And 1,000 rounds a minute from a gun, for three minutes, works out at 45kg of metal. So where are the henchmen with the wheelbarrows full of ammunition? And now ask yourself, will the world be a better place when we are in charge? Of course it will be. Â· The Mirror’s gossip columnists were delighted to spot Stephen Hawking at Stringfellows lapdancing club in London, where he was treated to dances by 19-year-old called “Tiger”. Perhaps she reminded him of his other Tiger, the Trans-Iron Galactic Element Recorder built to record cosmic rays at the McDonnell Centre for the Space Sciences. I’ll stop now. Â· And finally, I am delighted to see the Consumers for Health Choice movement is still going great guns with its campaign against the EU’s sensible plans to regulate and label potentially dangerous dietary supplements and herbal remedies. This in the same week that high-dose zinc supplements (as doled out by alternative practitioners for “physical and mental development, protection and healing”) were shown to more than double men’s risk of prostate cancer. You might be interested to know that the managing director of Holland and Barrett, Barry Vickers, is one of the directors of CHC. Anyway, if you are still keen on high doses of zinc, Auravita (www.auravita.com) will happily sell you 200mg zinc sulphate tablets at Â£5.99 for 90. But remember – that’s double the dose associated with prostate cancer. Just because it’s alternative doesn’t mean that it won’t kill you. 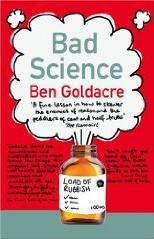 Â· Doing a New Age Bad Science Glastonbury Special is a bit like shooting fish in a barrel. Which is not to say I’ve had a change of heart: within five minutes of entering the Healing Field last weekend, I was handed a copy of the “Avalon Rising” leaflet. Pay close attention: “Celtic in your DNA? Cutting edge information has established the possibility that a substrand in our DNA connects us through the energy grid to one of 12 sacred sites, stargates or electromagnetic vortexes to enable the vibrational rate of Mother Earth to be energetically stabilised. Glastonbury is one such site. Its guardians are the time travelling grail lines of Celtic/Gaelic Britain: you!” Pseudoscientists everywhere, please note how easy it is to come across like a white hippy racial supremacist when you splash around with big words you don’t understand. Â· Brain Gym has struck a chord with many of you since we covered it last month. You might remember the jargon-heavy “educational kinesiologists” from California, with no peer-reviewed data to back up their grand claims for improving academic performance, who were being employed at considerable expense by UK local education authorities. I was moaning that teachers should be teaching our children how to spot this kind of pseudoscience, rather than peddling it. So I was heartened to receive frontline reports from science teachers of the fun they have teasing Brain Gym tutors visiting their schools.